LaBrie’s heaviest release to date, and it rocks! James LaBrie’s fourth solo effort, Static Impulse, can be viewed as either a natural progression of his earlier solo works, or a total curve-ball. When I first heard the opening track, “One More Time,” I did a double take to make sure I was listening to the correct CD! Not unlike the intentions of Dream Theater’s Train of Thought album, this is James LaBrie “Bringing the Metal!” However, what may polarize listeners is drummer Peter Wildoer, who shares vocal duties with LaBrie throughout the album’s twelve songs. Wildoer’s screaming, guttural approach gives the songs a decidedly Nu-Metal vibe which, quite frankly, is not everyone’s cup of tea. As much as I personally loathe the growling singing style, I have to say the contrast between Wildoer’s screaming and LaBrie’s honey-rich voice actually work quite well, especially on a track like the excellent “Jeckyll or Hyde.” And most importantly, the screaming doesn’t distract from, or overshadow, LaBrie’s vocals, which is a good thing, because the man is at his absolute best throughout the disc – just listen to the high-range singing on “Euphoric” for proof positive. Guitarist Marco Sfogli (you may know him already from LaBrie’s Elements of Persuasion or his work with keyboardists Alex Argento and Jordan Rudess) is an absolute master of the instrument – I would even call him “Petrucci-Worthy!” His blinding axe-work on songs like “Mislead” and “Over the Edge” is enough to send even the most accomplished guitar players humbly back to their metronome. There are some less-than-stellar moments however, such as the album’s final track, the ballad “Coming Home.” Not a bad track by any means, but the balladry sits uncomfortably with the crushing style of the rest of the album. Also, there is an element of sameness in many of the tracks, such as “This is War” and “Superstar” for example. Minor gripes aside, if you are a fan of James LaBrie’s solo work, Dream Theater, or progressive metal music in general, you owe it to yourself to check this one out. The production is crisp, the choruses are memorable, and the musicianship world class. Who could ask for anything more? Decent release has a few bright spots. Ever wondered what would happen if you mixed the intensity and screams of hard rock, the suave undertones of R&B, and some electronica influences, with a dash of Adam Lambert’s high vocals? Well, out of the oven comes Rites of Ash, ready to demolish what you believed the limits of musical diversity might be. They claim a broad range of influences including Lady GaGa, Linkin Park, T-Pain, and Billy Joel, but outside of Linkin Park, we were hard-pressed to find any elements of their other supposed influences and instead heard merely a touch of Faith No More. On their latest album, Like Venom, the first track, “Only Human,” sounds like Linkin Park meets La Roux with powerful lyrics that make you think about life and betrayal. Though the song is one of the best off of the album, lead singer, 80-Two (yes, that’s his name), seems to be trying a little too hard to hit the high notes with the way he sings only from his throat, as if to try and compete with Adam Lambert’s trademark sound. Use your diaphragm, boy, and lose the Pro Tools “Cher effect” on your vocals. It couldn’t be any more unoriginal, and it’s the one production value that marred the entire release, whereas the rest of the production was very well done. In “Dead Side of Hollywood,” Rites of Ash feature a fantastic female vocalist who brought a great new flavor to the music, but sadly she was given too few lines. Her presence was so strong that incorporating her singing into a few other tracks could have really raised the excitement level throughout the album. Another stand-out track, “Three Leaf Clover,” began with a beautiful piano melody accompanied by 80-Two singing the way we had been hoping for! With him putting his Adam Lambert mask away we are able to hear the raw talent he was blessed with as he puts his heart into every line including the memorable, “I was a three leaf-clover you thought was four.” This track showcased the band’s musical talent, which, although nothing out of the ordinary, included solid guitar and keyboard work from Lazzo, drums by Lumer, and bass grooves from Berry. By the time we were three-quarters into the album, however, we found ourselves tired, almost out of breath as the rollercoaster ride they created stopped abruptly. All of the sparkle and uniqueness they brought to first half of the CD faded, and the remaining songs began to blend together, leaving nothing to the imagination of the listener. It was just more of the same. Consistent; but unmemorable. Or perhaps we could attribute some of that tiredness to the major label-style mastering: yes, you competed successfully in the “loudness wars,” but Like Venom lacks the dynamics that a full-length album requires for engaged listening. Nevertheless, Rites of Ash took many chances with this album and was successful with many of their endeavors on it (particular on the first half of the CD). So ladies and gentlemen, if you are ready to attend a crazy and diverse concert without having to leave your home, take a chance on a wild ride with the Rites of Ash. Outstanding concert video captures an incredible band delivering an incredible performance, with impeccable audio and video presentation. Porcupine Tree are one of the finest bands in the progressive rock genre, and if you thought their first concert DVD, Arriving Somewhere, was incredible, just wait until you find yourself transfixed on this new concert event. The included Blu-ray version of the concert (a standard DVD is also bundled) really showcases why you invested so much money in a stellar home theater. Just like Rush is known for delivering concerts that sound album perfect, Porcupine Tree deliver the same high level of precision, but whereas the Canadian trio historically augmented their live sound with sequences, Porcupine Tree play everything live and augment their band with John Wesley, the unofficial fifth member… or sixth, if you also include film producer Lasse Hoile, whose visual support is an integral part of the live Porcupine Tree experience. Filmed by numerous high-definition cameras at the 013 venue in Tilburg, Holland, the two-hour concert features a live performance of the album Fear of a Blank Planet in its entirety, followed by a selection of other tracks from albums including Signify, Nil Recurring (EP written during the FOABP period), Deadwing, and In Absentia. They did a great job of not duplicating much from their first concert DVD, so feel free to load both concerts up and invite your friends over for an unforgettable evening of concert magic. 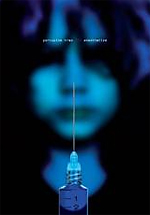 If you’re new to Porcupine Tree, we can wholeheartedly recommend this concert DVD as your indoctrination. It’s rare that we find live recordings worthy of introducing music as intricate as melodic progressive rock, but there is nothing but greatness here. The sound is stunning, the performance high on energy and riveting. In addition to the Blu-ray disc’s enhanced quality, it includes four of Lasse Hoile’s videos in their entirety. If you only caught part of the disturbing visuals during “Way Out of Here,” watching it in its entirety is riviting. However, if you’re currently taking antidepressants, we’d suggest staying away from the bonus material. Already a huge Porcuine Tree fan? (It’s so hard to feel middle-of-the-road about them.) What? You haven’t bought this one yet? Watch the DVD video trailer here. Excellent information for anyone producing music recordings. We were blown away by Bobby Owinski’s book, Music 3.0 (see review here), a must-read for any musician trying to find commercial success in the music industry. 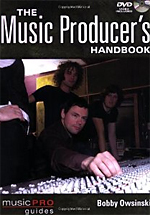 But while that title focused on the bleak landscape that is our present-day music industry, The Music Producer’s Handbook is a completely different animal, a book filled with wisdom and guidance sure to improve anyone’s skill assuming the role of producer on a music recording. Topics include understanding the role of a music producer, the business side of production, and the mechanics of producing a record. It’s within the mechanics section that you’ll come away with the most hands-on useful information. Owsinski goes into great detail regarding topics such as preproduction, basic tracking, overdubs, mixing, and mastering. This is an education in execution and process, though. It’s not about the mechanics of operating a DAW, for which there are many other books. We especially liked his focus on extracting great performances from the musicians, and knowing when it’s appropriate (or not) to involve session players in your project. Details are explored such as preparing appropriate headphone mixes, comping together the perfect vocal take, and nailing backing vocals. Did you know that a singer consistently going off pitch sharp or flat can be directly related to problems with their monitor mix? No? Get this book. The last section of the book is filled with some great interviews with well-known producers including Michael Beinhorn, Jack Douglas, Carmen Rizzo, and others. Also included is an interesting DVD that walks through the various steps of producing an actual rock band from Los Angeles, followed by some video interviews. Read a fantastic excerpt from the book here.